Boxcutters, Jigger, Muddler, Shaker Classic/Boston, Highball Glass. 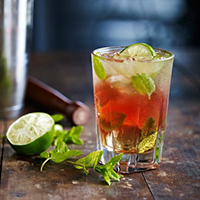 Put in the glass of the Shaker, the leaves of Mint, Lime and Agave Nectar. Gently crush with a Pestle. Add the Rum and Ice, then Shake. Pour into a Highball Glass, add the Campari and Prosecco.